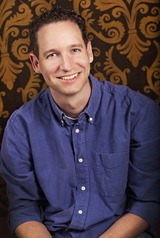 Interview with Aaron Johnston, co-author of the forthcoming Ender prequel novel Earth Unaware: The First Formic War, featuring a young Mazer Rackham, in bookstores July 17, 2012. This, our second podcast, features an interview by Alea (from Philotic Web) with Aaron Johnston, long time friend and collaborator with Orson Scott Card, co-author of Invasive Procedures, the Formic Wars comics from Marvel, and the highly insightful essay ‘Getting Ender Right: A Look at the Ender’s Game Screenplay Development” in The Authorized Ender Companion. See Aaron’s website for more information his background and output, and follow him on Twitter @AaronWJohnston. Listen to Part 1 of our interview here: Philotic Ansible #002a – Aaron Johnston, Part 1(mp3, 32:44– Right Click to Save), stream below, or subscribe in iTunes. In the first part of our interview, Aaron explains his history, background, and experience, and how he came to be a writer of fiction. He also explains his connection with the Ender’s Game film and screenplay as Associate Producer, gives us some tantalizing insight on the process of the film’s development, as well as thoughts on what he saw on the set of the film. Fun fact: Aaron’s going to be an extra officer in the movie. In Part 2 (coming next week), Aaron gets into detail about working inside OSC’s Universe, gives us some insight into the expanding of Ender’s world as seen in The First Formic War series of novels, and hints at what is to come in the future of the Enderverse. Stay tuned! Pre-order your copy of Earth Unaware today, and check out our special Audio Book Preview of the first 8 minutes of the book! 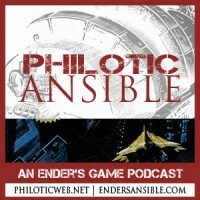 The Philotic Ansible Podcast is still new. Please tell us your thoughts in the comments- likes, improvements you’d like to see, and future topics or tell us on Facebook.